Material: paper. Easy assembly, just make the ribbon through the hole on the card. The bunting look lovely for bridal shower or engagement party party decoration. Quantity: 20pcs paper cards one set Color: As picture shown Material: High Quality Tissue Paper Ship Flat, Individually packed. 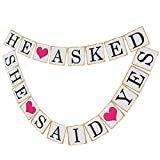 They look great for bridal shower or engagement party party decoration. Use them to create a dreamy background photo booth props for the event. lovely pattern, unique designs,really is very good party decorations and a limited number of flights. Shipping Time Note: We usually ship out by ePacket, it will takes about 8-15 days to be arrived. If you want to own it quicker,you can choose expedited shipping service.